These are lyrics by White Zombie that we think are kind of repetitive. 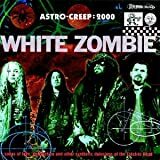 White Zombie's, "More Human Than a Human"
16 yeahs in each chorus!!! Why must Rob Zombie say that at the end of every setence?....Please tell me inquiring minds want to know!! !